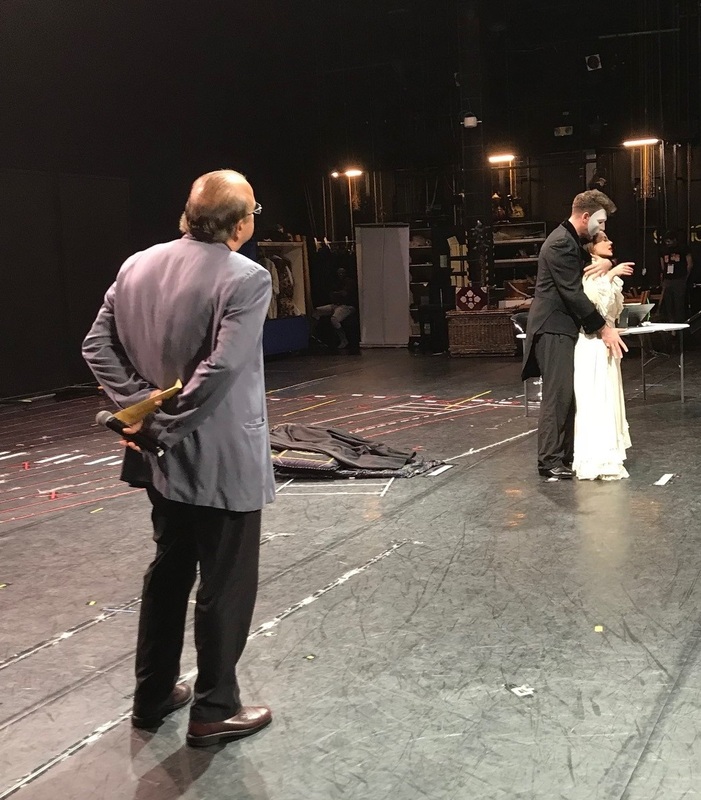 The cast and crew of THE PHANTOM OF THE OPERA have landed in Manila and all 130 of them are hard at work, getting ready for opening night at The Theatre at Solaire on February 20. Last week, members of the media were welcomed to their rehearsal space and ushered on to the stage to watch the performers up close. 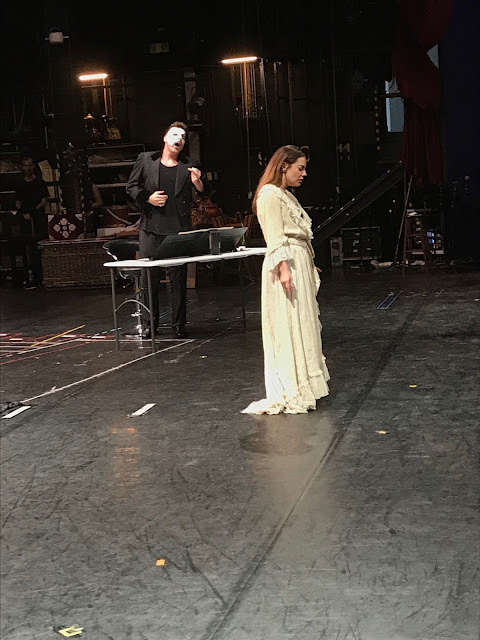 “Phantom of the Opera” lead stars Jonathan Roxmouth (as Phantom) and Meghan Picerno (as Christine Daaé) perform “Music of the Night” before members of the media during the open rehearsals. There were oohs and aahs all around as Andrew Lloyd Webber’s most famous and stirring music were sang. Associate Director, Arthur Masella took the lead and cued the actors. Once in awhile, he requested that some portions be repeated so we were treated with several replays. Phantom of the Opera Associate Director, Arthur Masella gives instructions to Jonathan Roxmouth and Meghan Picerno as they performed “Music of the Night”. 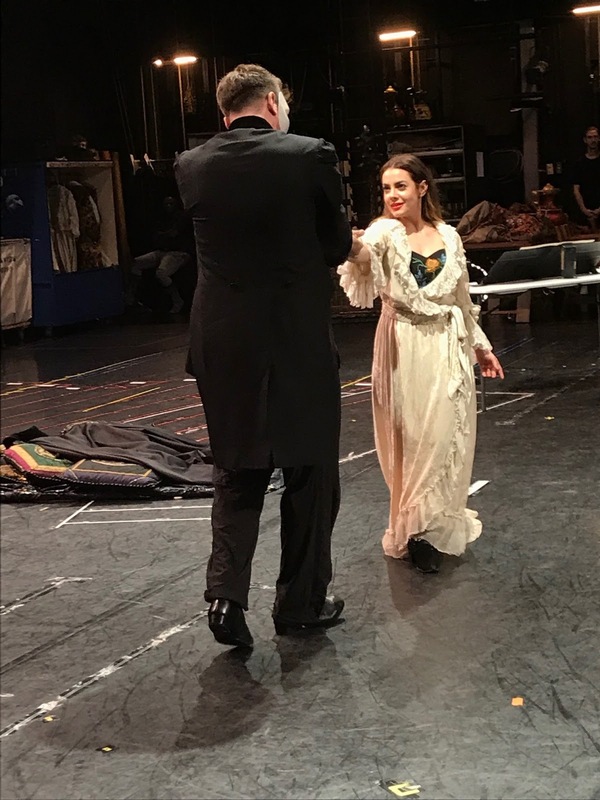 Young soprano Meghan Picerno as Christine Daae mesmerized with “Think of Me”. The audience was equally captivated by the rendition of “Music of the Night” of Jonathan Roxmouth as the Phantom. Roxmouth is also known for his roles as Che in EVITA and the Pharaoh in JOSEPH AND THE AMAZING TECHNICOLOR DREAMCOAT. Coloratura soprano Meghan Picerno previously took on the role of Christine Daaé in the US Premiere and 1st National Tour of “Love Never Dies”, the sequel to “Phantom of the Opera”. Many among the crowd hummed along as the company gathered and occupied the floor for “Masquerade”. “This is one of the best dancing ensembles that we have ever put together throughout the 30 years of working on this show, at least for me. We have a stellar ensemble, I’m so proud of them all,” gushed Denny Berry, Associate Choreographer. It is Jonathan Roxmouth’s second time to play the Phantom for the local audience. He was also part of the 2012 production which made a stop in Manila. “We always cast the best person we possibly can cast and we have a really quality cast.... no one who saw some of the original cast members or many many others who have followed that cast will be disappointed with our cast, I can assure you,” Masella guaranteed. THE PHANTOM OF THE OPERA will also be starring Matt Leisy as Raoul. Plus James Borthwick, Beverly Chiat, Melina Kalomas, Thabiso Masemene, Kiruna-Lind Devar, Sebastian Zokoza, Mike Huff, Joseph DePietro, Eric Anthony Lopez, Luke Grooms, Ian Jon Bourg, Michael Gillis, Rouel Beukes, Jennifer West, Robin Botha, Clara Verdier, Janelle Visagie, Jana Ellsworth, Deborah Caddy, Saverio Pescucci, Jesse Klick, Ayaka Kamei, Rachel Thalman, Claire Van Bever, Skye Weiss, Jarvi Raudsepp, Hillary Reiter, JeeHyun Noh, Lungelwa Mdekazi, Megan Ort, Oliver Druce, and Alexander Mendoza. Based on the classical novel of Gaston Leroux, THE PHANTOM OF THE OPERA tells the tale of a disfigured musical genius who haunts the depths of the Paris Opera House. Smitten by the talent and beauty of a maiden, he lures her as his protégé and falls fiercely in love with her, unaware that the maiden is in love with another man. This obsession sets the scene for a dramatic turn of events where jealousy, madness, and passions collide. THE PHANTOM OF THE OPERA became the longest running show in Broadway history on January 9, 2006 when it celebrated its 7,486th performance. On January 1, 2018, it celebrated its 13,000th performance and marked an amazing 30 years on Broadway on the same month. Worldwide, over 140 million people have seen THE PHANTOM OF THE OPERA in 37 countries and 172 cities in 16 languages. “This is the 3rd generation now of people coming to see it and they’re all struck and moved as we were 30 years ago. There’s something about the universality of the period and of the love story of rejection, of love for each other. Those transcend any period and generations as well,” Berry commented. 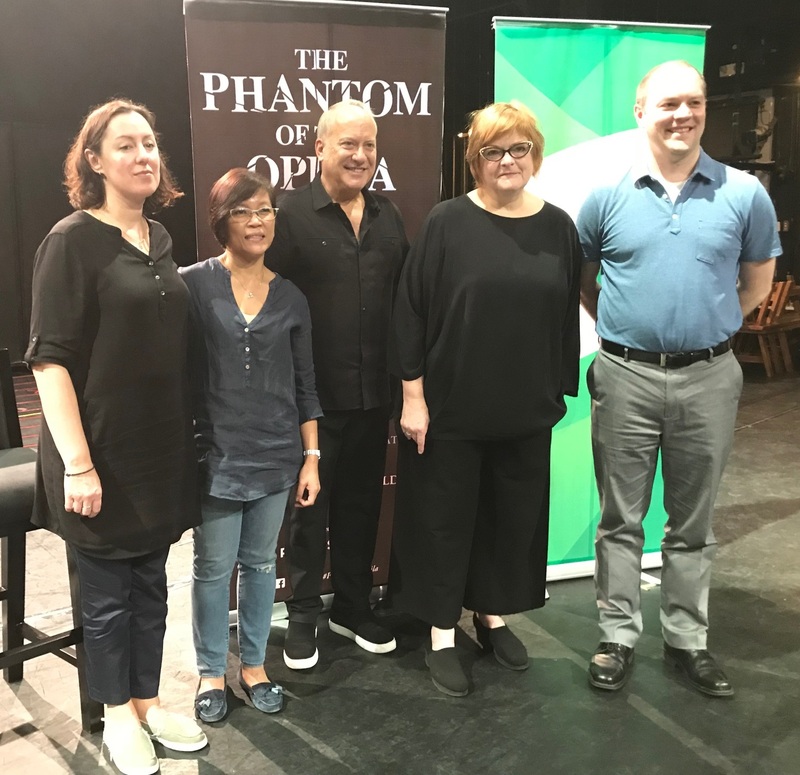 THE PHANTOM OF THE OPERA is presented in Manila by one of the leading promoters of live entertainment in the Philippines, Concertus Manila; and produced by one of Australasia’s leading producers of live entertainment, Lunchbox Theatrical Productions. Special thanks Nana Nadal for this article!